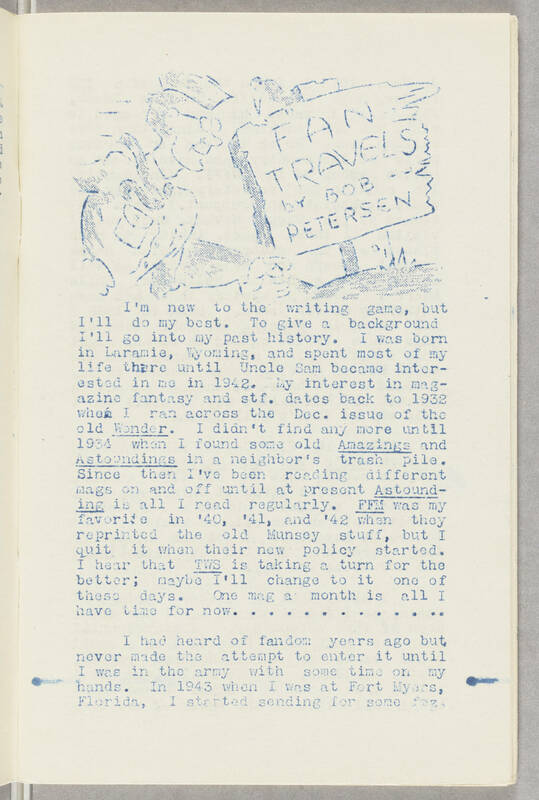 FAN TRAVELS by BOB PETERSEN I'm new to the writing game, but I'll do my best. To give a background I'll go into my past history. I was born in Laramie, Wyoming, and spent most of my life there until Uncle Sam became interested in me in 1942. My interest in magazine fantasy and stf. dates back to 1932 when I ran across the Dec. issue of the old Wonder. I didn't find any more until 1934 when I found some old Amazings and Astoundings in a neighbor's trash pile. Since then I've been reading different mags on and off until at present Astounding is all I read regularly. FFM was my favorite in '40, '41, and '42 when they reprinted the old Munsey stuff, but I quit it when their new policy started. I hear that TWS is taking a turn for the better; maybe I'll change to it one of these days. One mag a month is all I have time for now. . . . . . . . . . . .. I had heard of fandom years ago but never made the attempt to enter it until I was in the army with some time on my hands. In 1943 when I was at Fort Myers, Florida, I started sending for some fmz[[? ]].